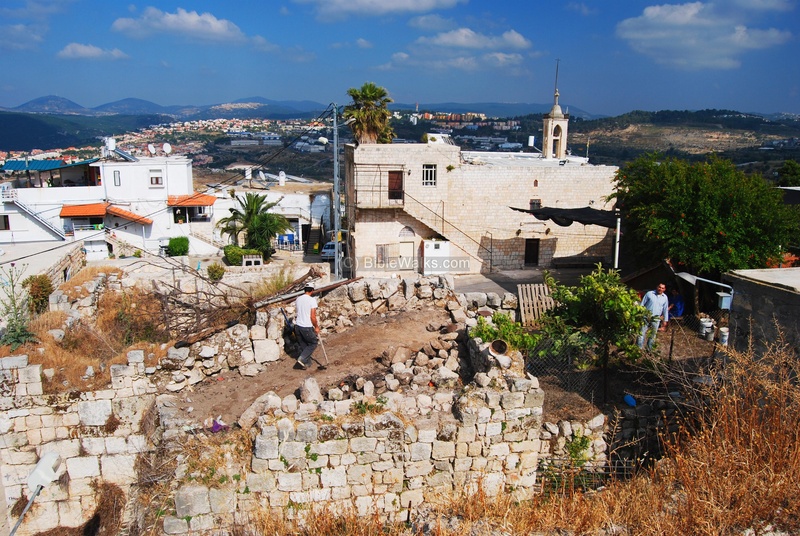 A Greek Catholic village in the west upper Galilee, built over the ruins of the 12th C Crusader fortress. The fortress first belonged to the Crusader King Baldwin III, and was called the "King's fortress" , then owned by the De Milly family. The site was a large Biblical city, identified with Aloth. 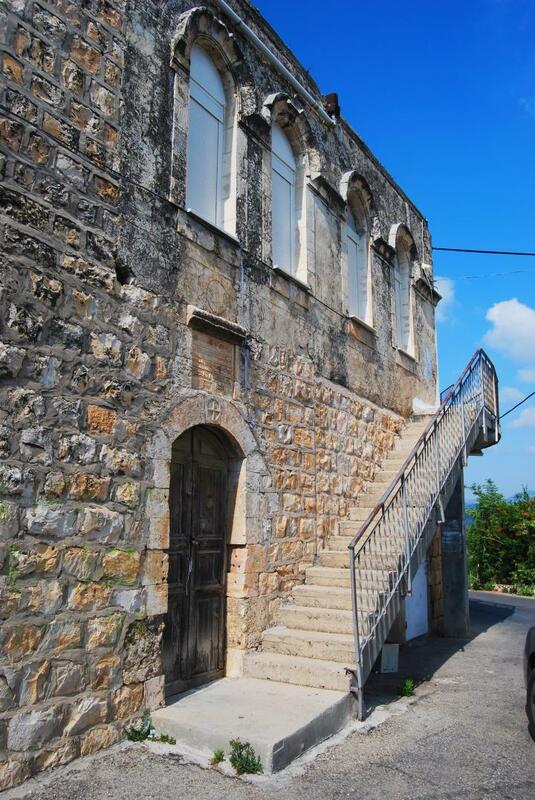 1 Kings 4:16: "Baanah the son of Hushai was in Asher and in Aloth"
Mi'ilya is a Greek Catholic (Melkite) village in the west upper Galilee. 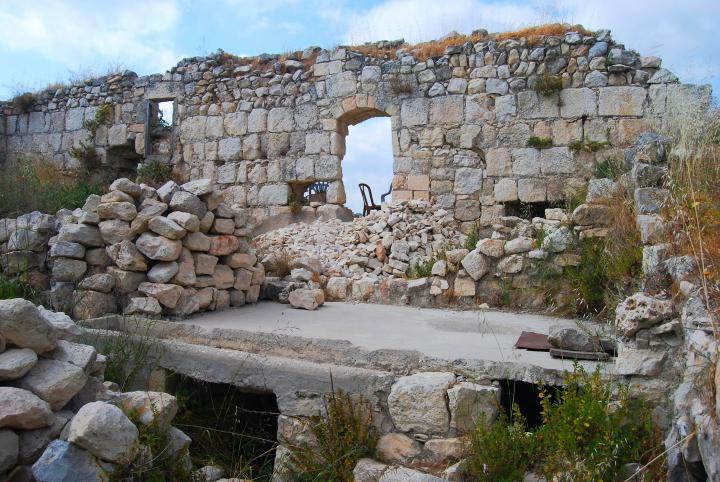 It was built over the ruins of the 12th C Crusader fortress. The fortress first belonged to the Crusader King Baldwin III, and was called the "King's fortress" (Chateau de Roi, Castellum Regis). It was then owned by the De Milly family, one of the most noble Crusaders families, who owned 36 farms and villages in the area. The site was also a large Bronze and Iron age city, and is identified as "Aloth" which is listed in the cities of King Solomon. 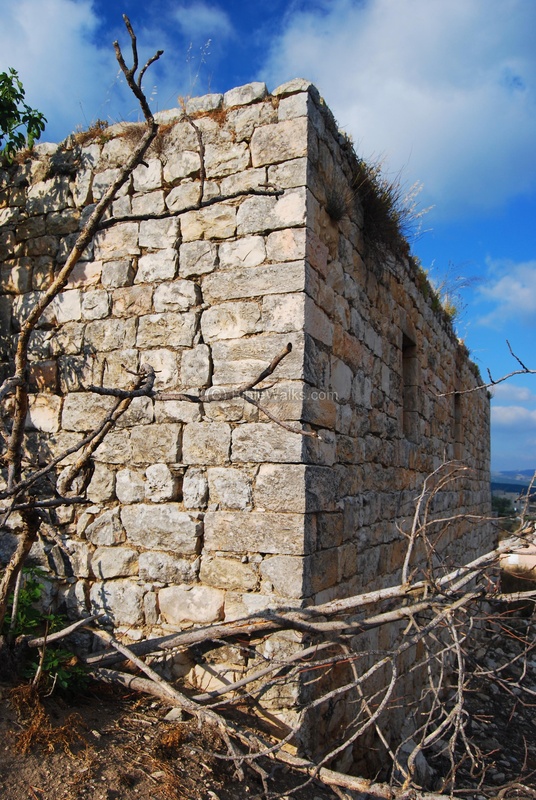 The village of Mi'ilya is located on the main road from Acre to Ma'alot, south-east of the Montfort castle. 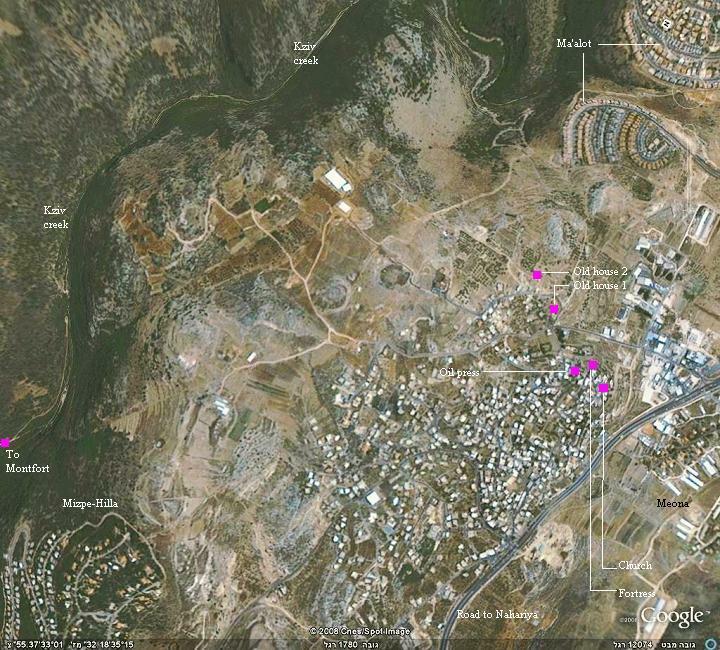 According to recent excavations, the hilltop site of Mi'ilya was a major MB (Middle Bronze, 2200-1550BC) and LB (Late Bronze, 1550-1200BC) site, about 24 hectare in size, the largest in the western Galilee. Most of the findings were from the Iron period (Early Israelite: 1200-1000BC, Middle/Late Israelite/Babylonian: 1000-539BC). The scholars identify the site with Aloth, a city of Baanah Ben-Hushai, one of King Solomons officers (1 Kings 4:16: "Baanah the son of Hushai was in Asher and in Aloth"). The Tribe of Asher is added here since the city may have been initially part of the tribe of Naftali, and was given to the tribe of Asher after the Hiram-Solomon Cabul pact. The name of the Biblical city, Aloth, is the basis of the modern city of Maaloth which is located east to the village. The city was destroyed in the 6th Century by the Babylonians. The city was rebuilt during the Hellenistic period (4th C BC-1st C BC), and grew in the Roman and Byzantine (1st C BC-6th C AD) periods. Roman period columns are on display in front of the church. The site was destroyed in the early Arab period (8thC). 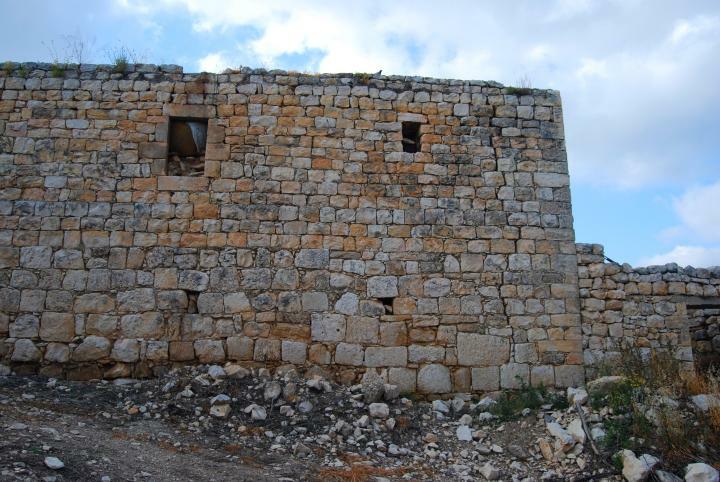 The fortress was built in the 12th Century on the top of the highest hill. 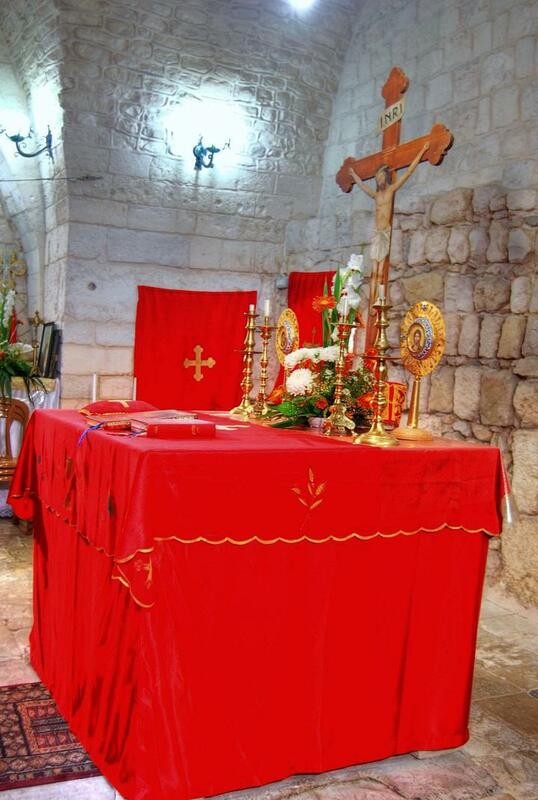 It belonged to the Crusader King Baldwin III (King of Jerusalem and Cyprus 1143-1163). It therefore was called the "King's fortress" (Chateau de Roi, Castellum Regis). In the middle of the 12th Century it was transferred to the De Milly family. The De Milly's were one of the most noble Crusaders families, owned 36 farms and villages in the area, and made the village the center of their independent feudal estate. The De Milly name is also the root of the village's name. 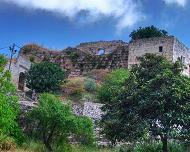 The fortress was captured by Saladin in 1187 after the defeat at the Horns of Hittim, but was returned to the Crusaders in 1192 after a treaty. It was sold in 1220 to the German Teutons - Crusaders that came from Germany in the 13th C AD and established the Teutonic order. In 1228 the new owners moved the center from this fortress to their nearby castle - the Montfort. In 1265 the fortress was captured and ruined by the Mamlukes, and it remained in ruins for about 500 years. During the 17th Century a group of Greek Catholics migrated from Lebanon to the village, and its former Muslim residents moved out to a nearby village (Tarsheeha) and their mosque was leveled. 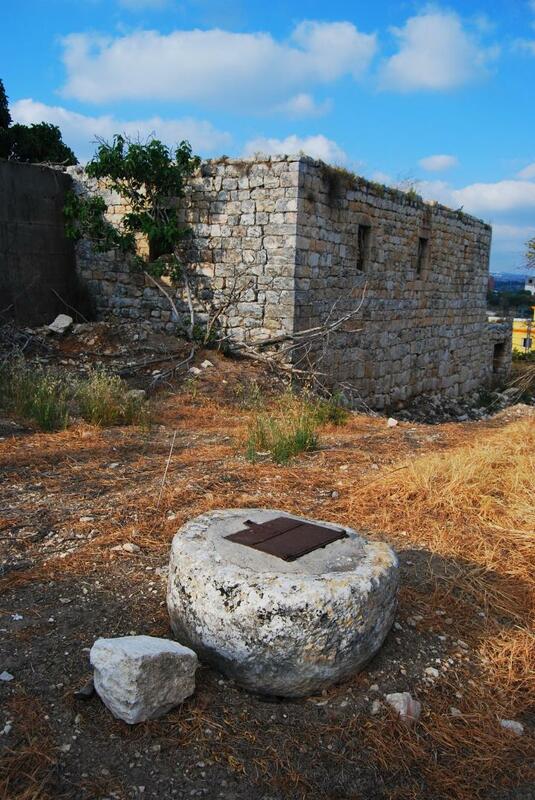 In 1845 they built the Church on top of the hill in the ruins of the Crusader fortress, naming it after Virgin Mary. 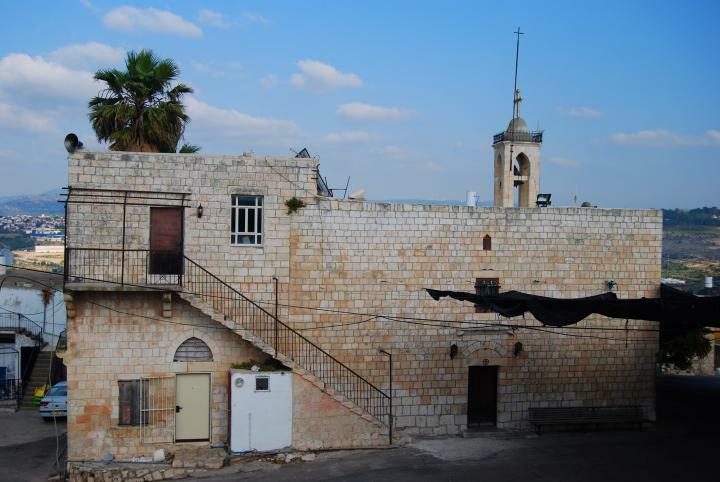 This Arab village is one of the two villages in the Galilee which are solely Christians. The church is open to the public, and serves the Greek Catholic Melkite community. 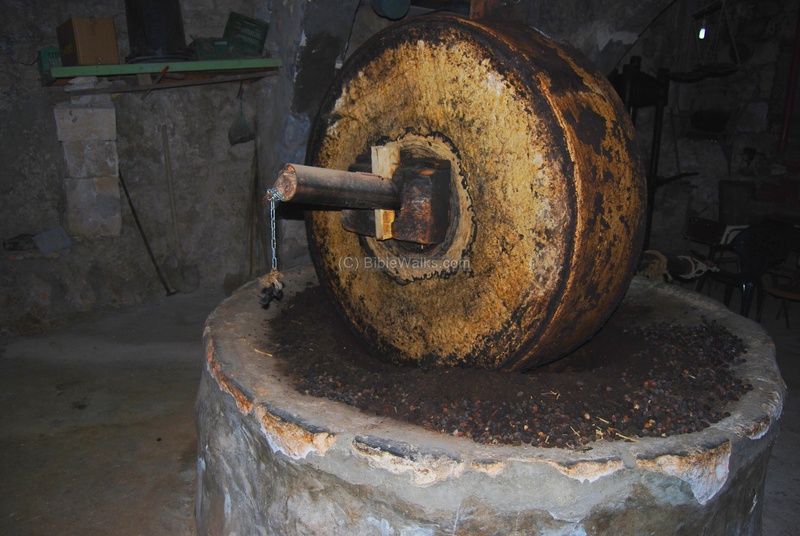 An ancient oil press is also open to the public, and is reviewed in a separate web page. 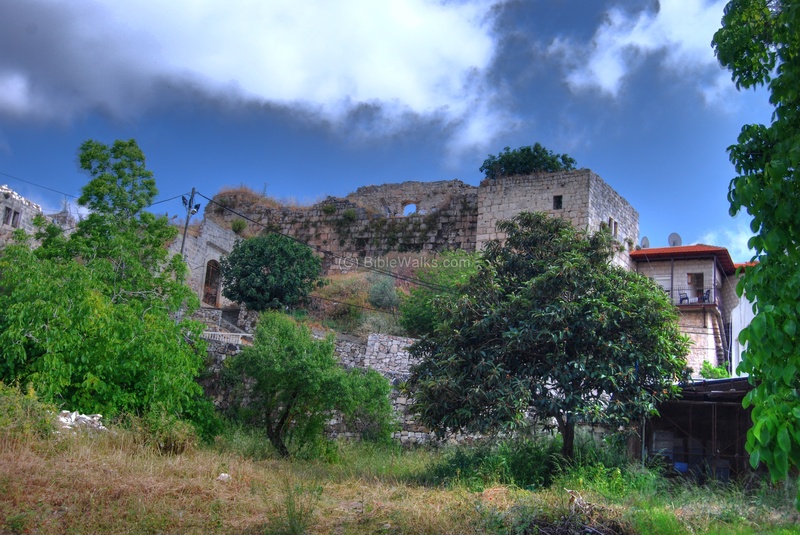 The photo shows the view of the Crusaders fortress, as seen from the bottom of this steep hill. The fortress is in a bad shape and only few sections of the walls remain. 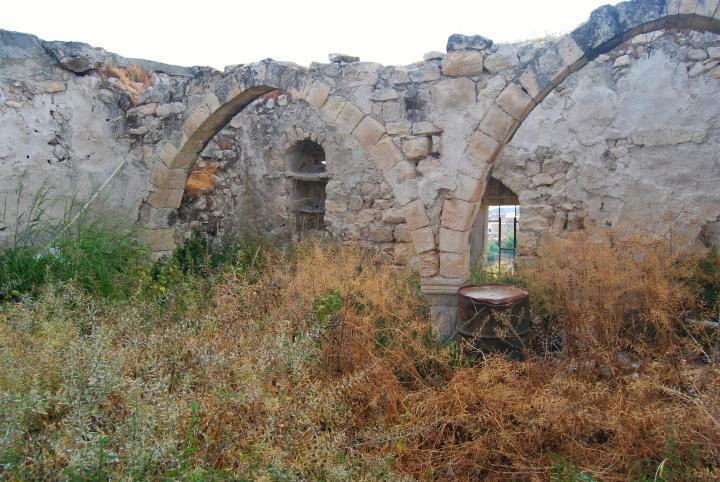 Some Ottoman period houses were built inside and around the ruins. This is the view inside the fortress, where a small section of the tower remains standing. 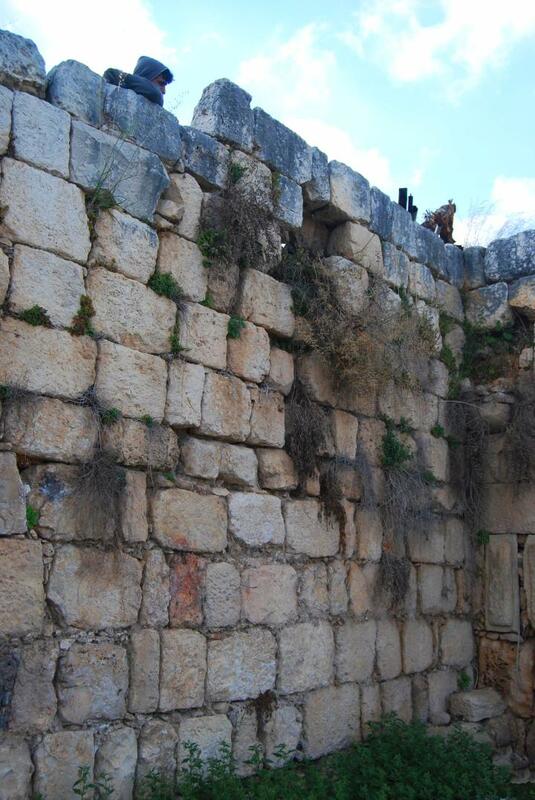 The photo below shows a section of the 12th C Crusaders walls, facing the church. 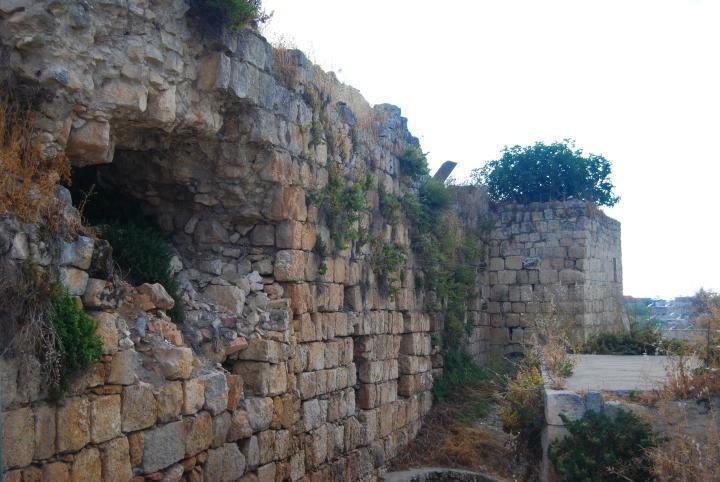 The photo below shows the ruins of the north walls of the Crusader fortress. Near these walls are ruins of old Ottoman period houses, as the one seen below which is adjacent to the fortress. Some of these houses embedded Crusader period stones. View of the church, as seen from the ruins of the castle. 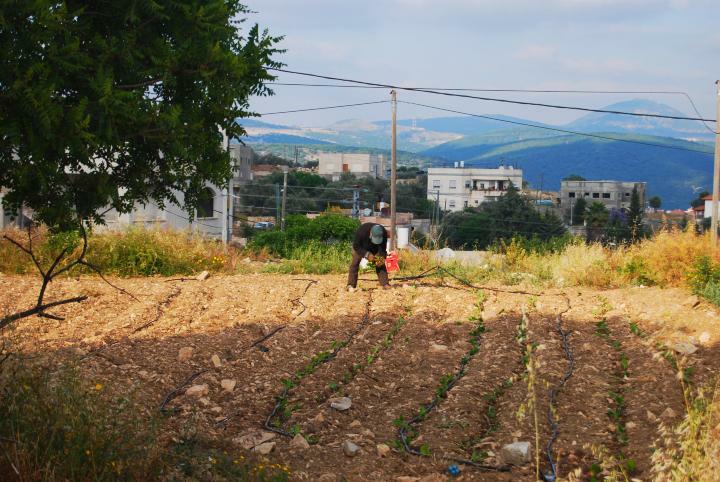 In the far background, east of the site, are the high hills of Upper Galilee, including Mount Meiron on the left (the highest in the west side of the Holy Land- 1208M). A closer view of the west side of the church. The church is named after the annunciation, and the statue of Virgin Mary is located in the yard before the church. On the ground are Roman period columns that were excavated in the site. Beneath the pavement were excavations, which revealed Middle Bronze (MB) period findings, which was part of the largest MB site in the western Galilee. 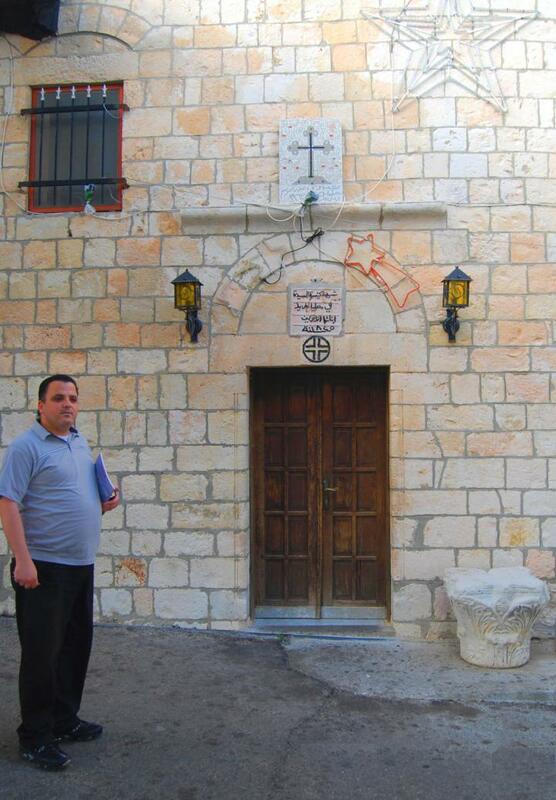 Father Hadi Kassis, assistant to the priest, welcomes us in the entrance to the church. He is an excellent guide and we thank him for his assistance. 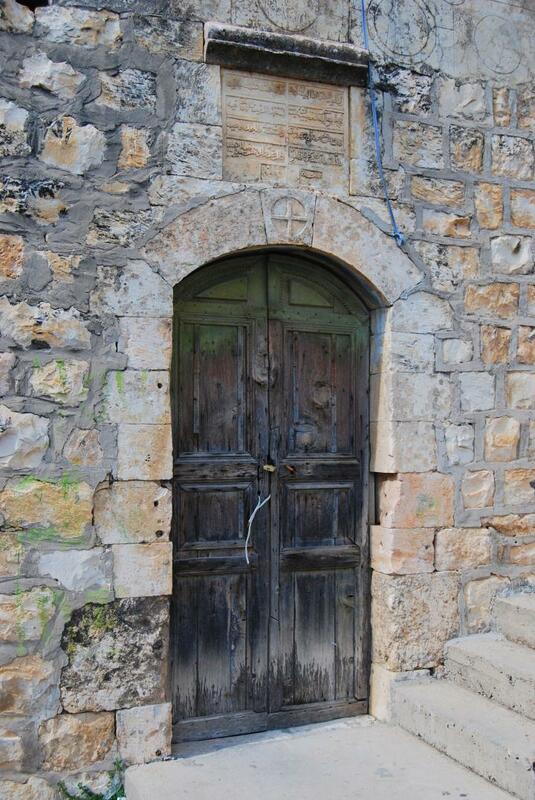 The sign above the entrance reads in Arabic: "Church of our Lady in Mi'ilya built by the first sons in 1845". A view of the nave (hall of the church) . 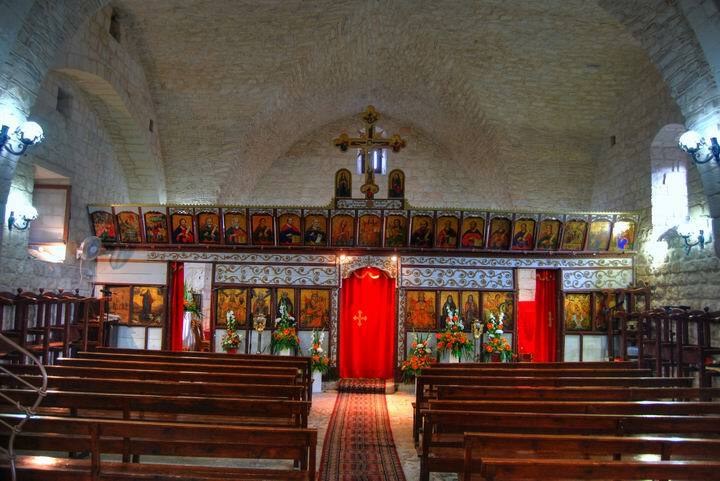 On the front is the "Templon", a decorated covered screen with icons and paintings, which separates the hall and the holy place behind it (the altar, or sanctuary) behind the center door. There are two other doors that lead to the back of the screen. 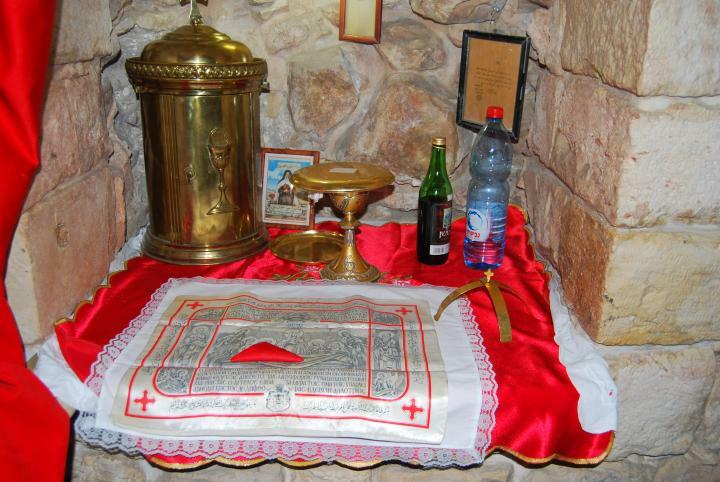 A detail of the "Templon", decorated with icons and paintings, is seen below. The icons were crafted in Syria, and apart from their artistic purpose, they were used to describe the stories and history to the attendees of the church. The icons are ordered in a sequence that is common to all Melkite churches - the Holiest are in the center above the entrance to the altar, and all are facing the center (towards Christ). 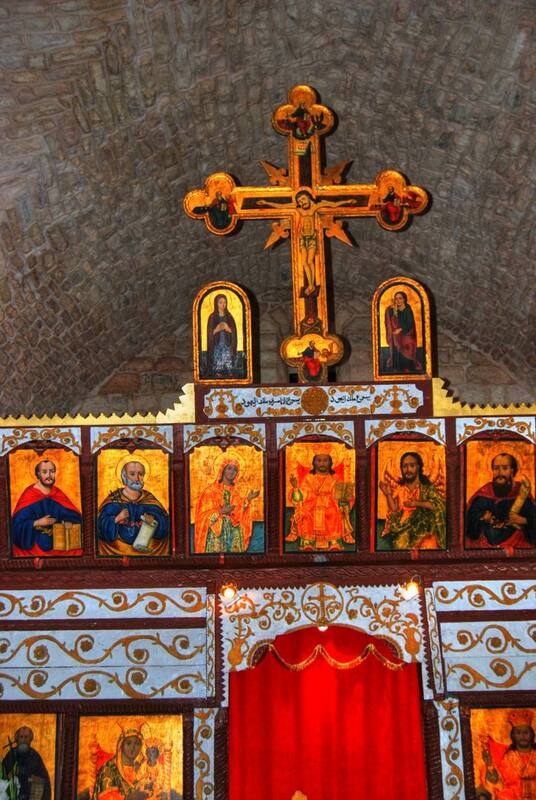 The icons include Virgin Mary to the left, some of the Apostles, John the Baptist (the forerunner), founders of the Church, Saints and prophet Elijah (on the right). The Altar is seen below. The initials on the cross (INRI) mean "Jesus of Nazareth, King of the Jews", but in Latin rather than in Greek (INBI). 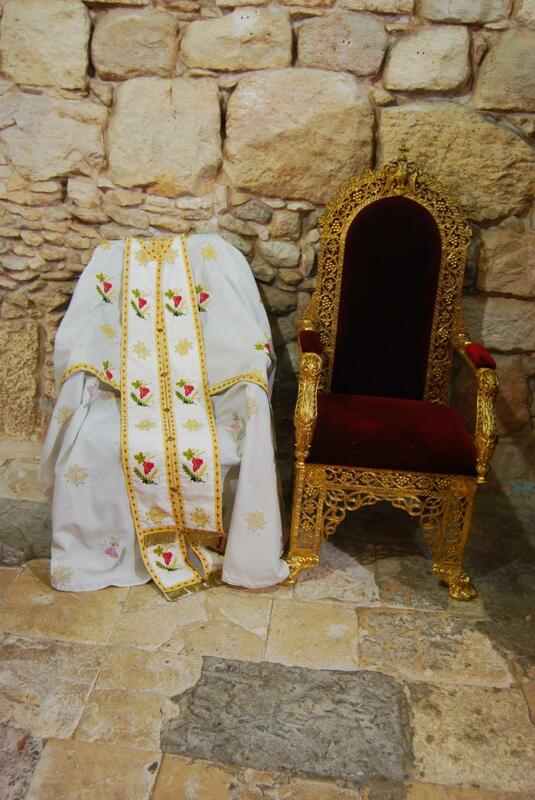 The Bishop chair and the priest garments are seen below. A corner with the bread of life is seen in the photo below. 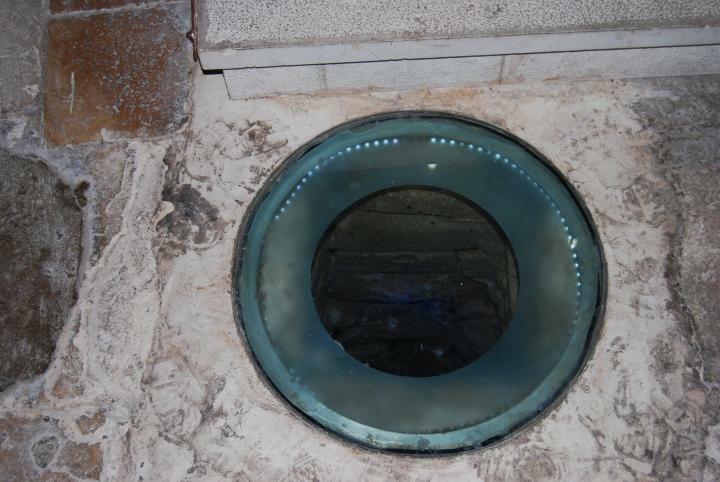 In the center of the hall is a covered hole in the floor, a sealed cistern. 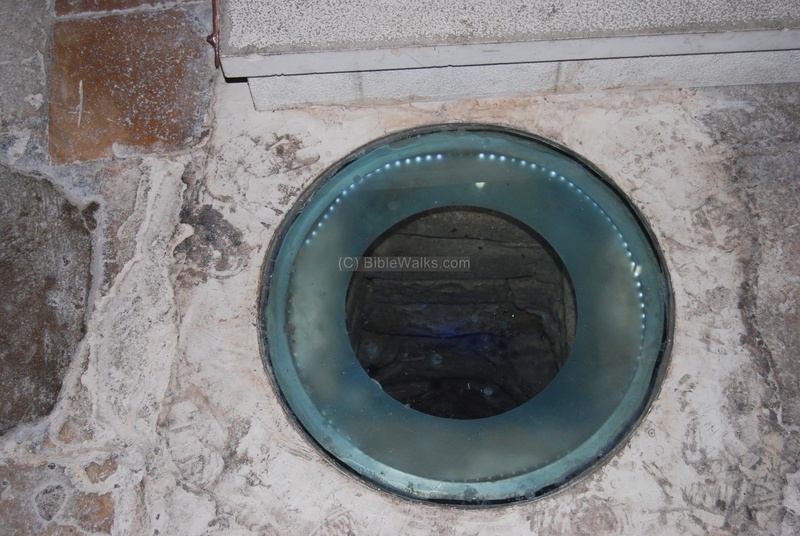 It was used for pouring the baptism water. During the archaeological survey, there were interesting findings in this cistern. An illustration with Elijah slaying the false prophet is one of the paintings that decorate the church. Elijah plays an important role in the church. 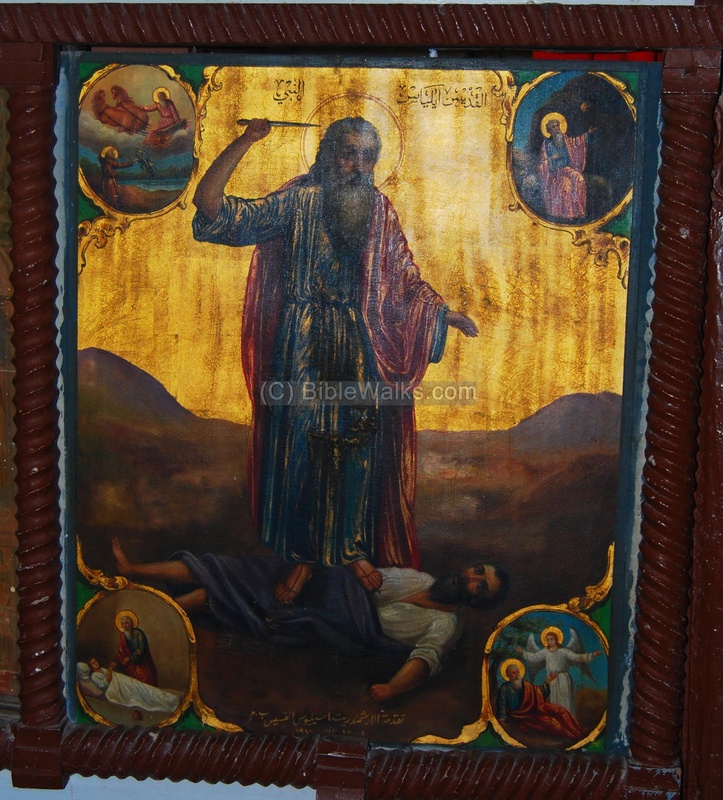 According to the tradition and Biblical texts, Elijah gave his spirit and power to John the Baptist, the forerunner of Jesus; and in the transfiguration event on the high mountain, the disciples see Jesus transfigured in presence of Elijah and Moses. 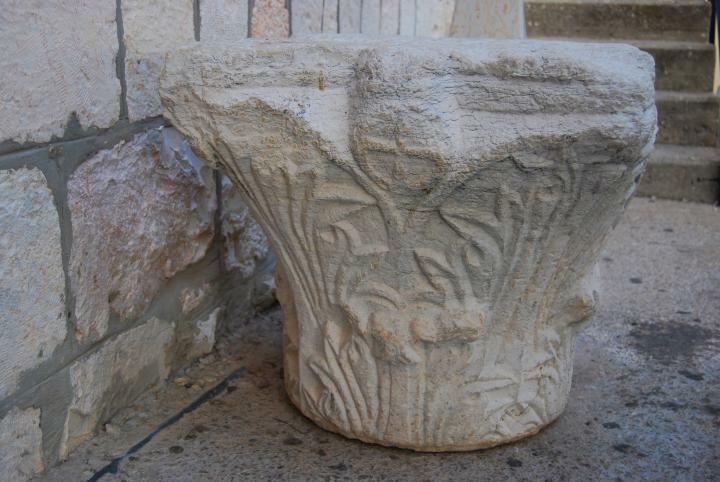 In front of the church are very interesting Roman column capitals that were excavated at the site. 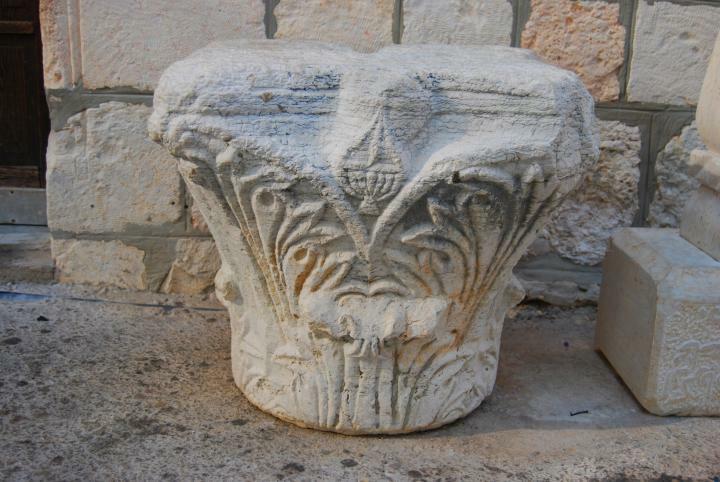 The photo below shows a capital with, what seems like, a Jewish symbol: a carving of a seven-branched candelabrum (Menorah) that was used in the Temple (as carved on the Titus Arch in Rome). Therefore, the earlier structure may have been a synagogue. Above the candelabrum is a possible Christian symbol - the cross, so this may have been a mixed Jewish-Christian community - when the Religions were closer. Another theory, suggested by Yoav Avneyon, is that this symbol is a thurible - a metal vessel suspended by chains in which the incense is burnt during services. The three lines on top of it are the chains that hold it upright. This theory was accepted by two prominent archaeologists. A cross is more visible on this capital, seen below. 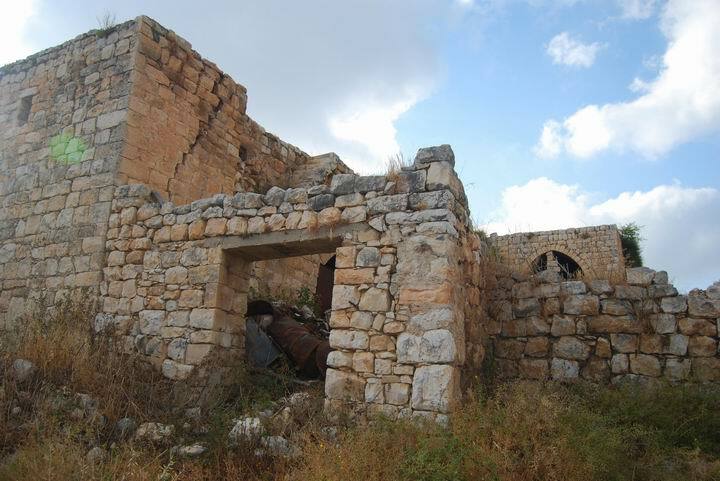 An interesting old house, dated to the beginning of the last century, is located on the main road below the fortress. The stone tablet above the door marks the year of 1914. 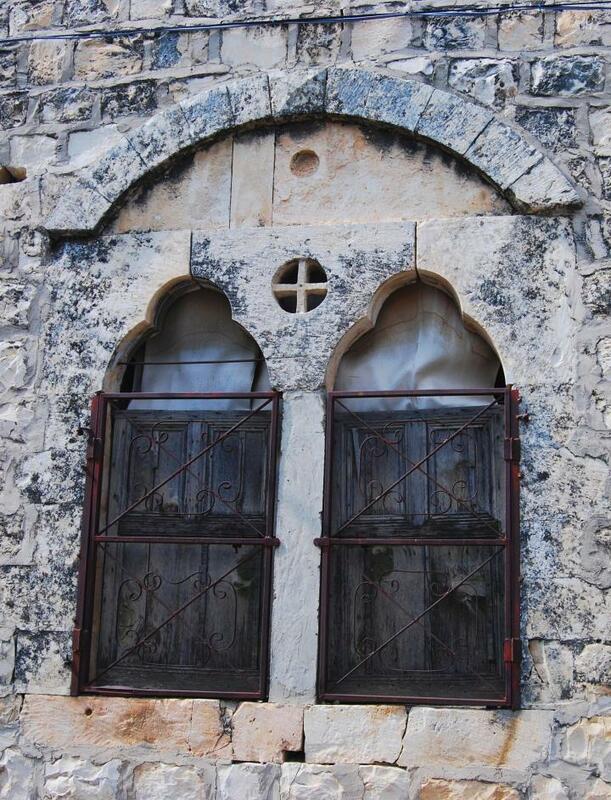 The photo below shows a nice window on the left of the door. Since I am hooked on old stone buildings, it was a must to show this interesting architecture design. Another interesting ruins are located across the field. The photo below shows that house from the south-east side. On the west side of the house is an old well, with a stone head and an iron cover. The south view of the old house is seen below. On the side of the old house, a neighbor is seen hand planting in the field. The high mountain of Meiron is seen in the far background.